One place we visited on our mini moon that I felt deserved it's own post was the seaside town of Clevedon. 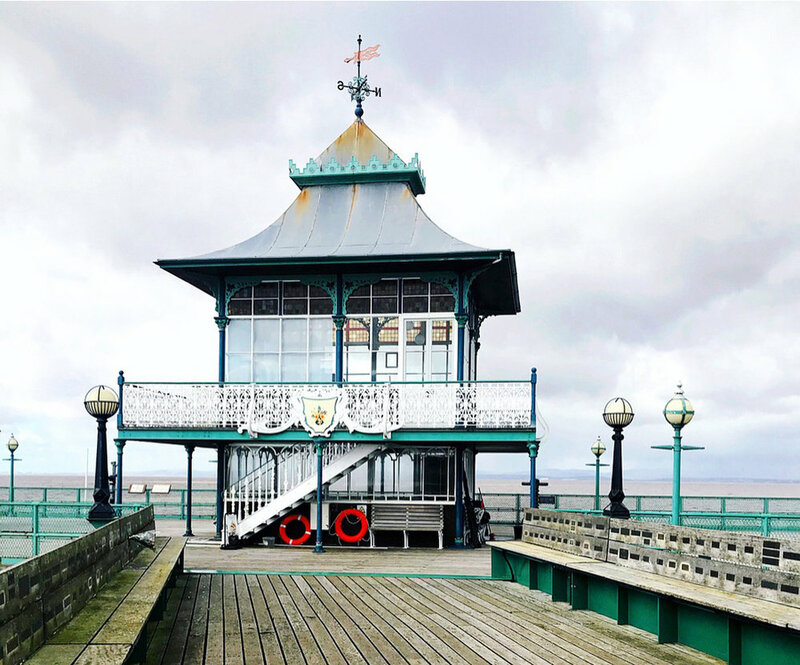 Walking along the pier, visiting second-hand shops and popping into the 100 year old cinema meant we felt like we were stepping back in time. In true blogger style I discovered Clevedon via another blogpost (ta Bath Mag) - which led us to places like 'Murrays Deli' and 'Midgley Green' along with a few others. We started the day with a visit to the pier (something I was excited about, especially as I'd heard One Direction had also graced the wooden boardwalk). There wasn't much at the end but the view was enough and the visitor centre had some artwork for sale where we purchased a few prints/cards. Lunch at Tiffin on the pier was sumin' else...maybe slightly too early for crab salad but it was really good. Wes had 'the best fish finger sandwich' he'd ever had (and he's had a few, I also liked that it was served up in newspaper wrapping. Shopping wise, we ventured a street further to home decor/gift shop - Midgley Green where we bought some lovely bits. Across the road Sakers Stationery was designer heaven - filled with notepads, prints and pencils. Even as we walked into Murrays Deli for dinner (make sure you book), I was told by a customer how good it was. Mostly italian dishes on the menu, I went for lamb meatballs covered in ricotta and tomato - I wish I remembered what 'the husband' had but I only hesitated long enough to take a photo of my own. Lovely spot for dinner followed by drinks at The Limehouse.